When Karl Rove's critics--his conservative critics--learned of his new effort to shape Republican politics, the hashtag #crushrove popped up on Twitter. Rove's intraparty foes insisted that his Conservative Victory Project be stopped: It was an effort to sideline the tea party, protect incumbents, and bleach conservatism out of the GOP. But Rove's critics are wrong. If the Republican Party wants to evolve and the tea party wants a place in it, don't #crushrove, #hugrove. Is the Republican Party headed toward civil war? Almost everyone connected to the GOP has opined recently about how the Republican Party needs to evolve after the 2012 election defeats. Gov. Bobby Jindal has given speeches, Rep. Paul Ryan has offered views, and this week House Majority Leader Eric Cantor invited everyone down to AEI to offer a few thin policy proposals aimed at rebranding. This paddling around in the shallow end is fine, but if there's going to be transformation, the Republican Party needs leadership and clear choices. Rove is offering both. The other would-be visionaries are playing it safe, but Rove has joined Sen. Marco Rubio in actually putting action behind the talk. The idea of the Victory Project is that Rove and his allies will pick sides in Republican primary campaigns, supporting candidates who can win in the general election. This idea has infuriated many conservatives, and prompted an outpouring of ridicule. "In 2012, they spent hundreds of millions of rich donors' money and had jack to show for it," wrote RedState's Erick Erickson. Town Hall's Terry Jeffrey cataloged every conservative sin of the Bush administration in a piece titled "Karl Rove is Not a Conservative." Influential conservative radio host Mark Levin referred to him as "doughboy" and levied a series of charming attacks, including a critique of Rove's penmanship. Rove says he has been badly misunderstood (I know the feeling). He's not trying to protect incumbents, he says, but to make sure that the best conservatives can get elected. He points out that his 2012 Crossroads super PAC supported lots of tea party candidates. This hasn't calmed the anti-Rove fury. 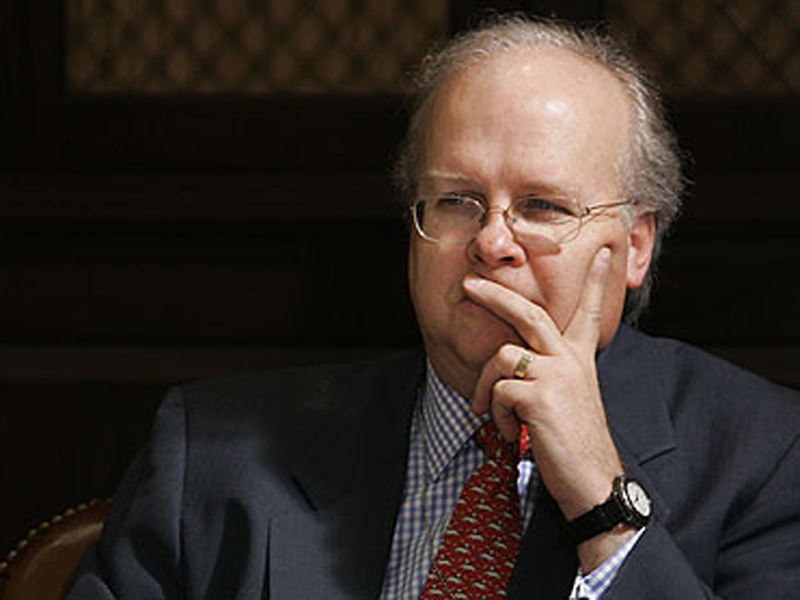 Many groups are interested in hyping the idea of a civil war between Karl Rove and the GOP. The press loves a catfight, and when Donald Trump calls Karl Rove a "total loser" it's going to get covered. Movement conservatives raise money by turning Karl Rove into a bogeyman. And Rove raises money, too, because the attention attracts donors who want to see the irrational grass-roots neutralized. Acts of performance umbrage may start taking place on the mall. I just got one such solicitation from a Rove critic, an email from tea party favorite Christine O'Donnell, the 2010 failed GOP senate candidate from Delaware, who was raising money off of the Rove outrage. (You remember O'Donnell as the candidate who had to deny that she was a witch.) Hers was a race of just the type Rove is trying to shape. Had Mike Castle been the GOP nominee, he'd probably be Sen. Castle right now. Rove believes that candidates like O'Donnell gave away likely seats in Nevada, Colorado, Indiana, and Missouri during the last two election cycles. The GOP might control the Senate today if sharper candidates had prevailed. This line of thinking outrages movement conservatives and tea party activists. They chalk up the defeats to the liberal media, which lampooned true conservatives by fixating on their minor missteps. By pledging to support more electable candidates, Rove is buying in to the frame that the media puts around true conservatives. This theory may be reasonable or it may be poppycock. Either way, Rove's detractors should thank him for bringing the debate into the open. Rove's new effort is good for the tea party in the way that doubters are good for religions. No faith worthy of its Sunday parishioners crumbles under a challenge. Leaving aside whether Rove is really challenging the core of tea party beliefs, his efforts force those who hold a different view into being clearer about what they believe. Only if they go through that process can they make their case to Republicans who aren't already true believers. Plus, if they can't beat Karl Rove at the internal game, they're not going to be able to beat the Democrats.